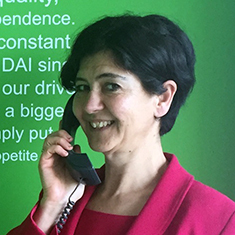 Sarah Maguire is the Director of the Governance team at DAI Europe. Sarah practiced at the Bar of England and Wales in criminal defence, immigration, asylum, and family law before joining the U.K. Department for International Development as Senior Human Rights Adviser. She has more than 20 years of experience at the country level, and international and policy experience with governments, NGOs and UN entities. Sarah has worked mainly across South Asia and Sub-Saharan Africa, implementing, managing, and evaluating programmes in fragile and conflict-affected states. At DAI, Sarah has been Technical Director on human rights and justice sector programmes including the AAWAZ Voice and Accountability Programme in Pakistan, Building Resilience in Civil Society in Kenya, Access to Security and Justice in Sierra Leone, and Enhancing Democracy and Civic Engagement in Pakistan. Sarah is recognised globally as an expert on the practical application of international human rights law; women, peace and security; violence against women and girls, and justice sector reform.